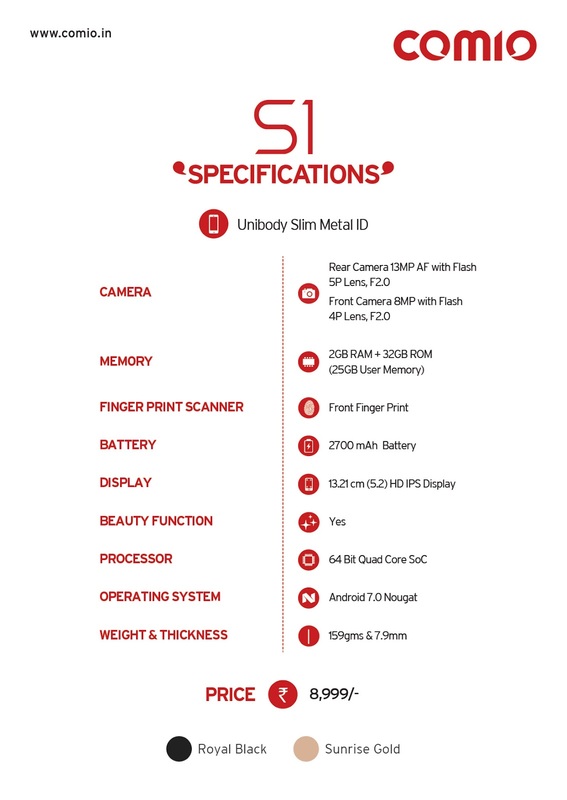 The COMIO S1 Smartphone has a 5.2-inch 720P HD IPS Display Metal unibody structure with curved edges that provides it a premium look. This handset features slim-sleek design with metal finish it makes phone easy to carry and visually appealing in equal measures. COMIO S1 handset is 4G Dual Sim smartphone which has a hybrid Sim slot. It is powered with a 64Bit Quadcore Mediatek chipset processor that is coupled with 2GB of RAM and 32GB of onboard internal storage that can be enhanced upto 256GB of more space via microSD Card that can be placed in its hybrid sim slot. This handset runs on Google’s latest android operating system Nougat v.7.0. For network support it has 4GVoLTE feature. It also has Fingerprint Security feature. For Photography it equips a 13 Megapixel Auto Focus 5P lens Primary Camera with LED on its back and on front panel it has 8 Megapixel Selfie Camera that accentuates every intricate detail. For power backup it packs a 2700mAh Battery that makes COMIO S1 a worth buying device. This handset is available in offline market for sale and it comes in two color variants - Royal Black and Sunrise Gold. It is priced at an affordable price range of Rs.8,999/- only. It also includes launch offers, after sale service and upgrade options just like COMIO P1 smartphone.